This is our new Aussie "KARMA". We got her from a breeder in Santa Rosa. She is now 9 weeks old and has won a ribbon at a dog show already!!! More to follow. Comments for Our New Aussie "Karma"
Is David Ramey still breeding? I got my Tioga from Melody Aussies two years ago, and she is quite the herder. Now I am seeking a male Aussie puppy to join the family. Hope she is still in the business! 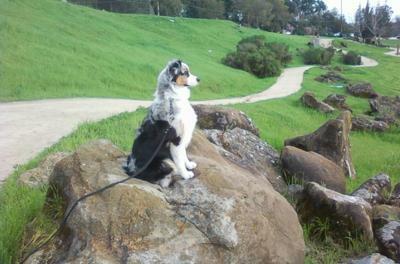 This is a updated picture of Karma from when we were out for a walk. She is watching Geese in the distance. I can see why... this little pup is a cuttie. I have 2 blue merle rescue dogs. One is 9 and the other 5. The older has been with us 5 yrs and the younger 1 year. They are both therapy dogs and most of all great companions. I wish you well! Congratulations to you and Karma on her new ribbons! Thanks so much for posting info about Karma's breeder -- I'll definitely be getting in touch with her. Karma has two more ribbons under her collar! Starting obedience training this week-end. Next show in April. We got Karma from Melody Australian Shepherds owned by Senior Breeder Judge Cathy Davis. I don't know if she has any puppies available right now but she can put you in touch with someone who does if she doesn't. Cathy has been breeding great Aussies and for over 20 years. Sorry for your loss. Listed on this website under Breeders. This is where we adopted Karma from. I say adopted because she is a wonderful part of our family. Dave... Karma is *beautiful*. After losing my beloved 14-year-old Aussie Jackson earlier this year, I am getting ready to make a home for a new dog, pup or adult, but Aussie of course. I live about 2 hours from Santa Rosa and wonder if you'd mind sharing the breeder's contact info. Thanks and good luck in Karma's next show! Heading for another show this weekend. Karma is a bundle of energy and chases our 56 pound oversize Sheltie around the house!